Vin de noix is an aperitif made from red wine macerated with green walnuts and walnut leaves, then fortified with alcohol and sugar. 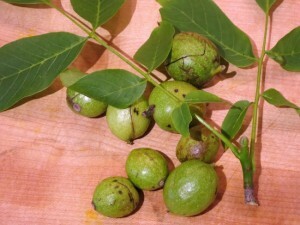 It is traditionally enjoyed at the holidays, as the green walnuts are ready to pick on St.-Jean’s day (June 24) and it needs about 6 months of aging before drinking. 1. Wash the walnuts and walnut leaves, drain. Using a mallet, crack the green walnuts without breaking them into pieces. 2. Put the walnuts, walnut leaves, cloves, nutmeg, bay, orange peel and allspice in a large crock with a lid. Cover with the red wine, weight the top with a plate so that all the walnuts and leaves are completely submerged. 3. Cover the crock with cheese cloth, then the lid. Leave in a cool cellar for 40-60 days. 4. Stain the wine though a fine chinois lined with cheese cloth to remove all the sediment (I find it easier to remove most of the solids with a slotted skimmer first, then pour the wine thought the strainer/cheese cloth). 6. Divide the walnut wine into clean, sterilized bottles. Cork with clean corks. 7. Leave the walnut wine in a cool cellar for 6 months. Note that, although the addition of alcohol to the wine is supposed to stop any fermentation due to naturally occurring yeasts on the walnuts and leaves, I have had a bottle blow its cork during the cellaring . If your cellar is not fairly cool (say below 58 degrees) it is wise to use wire cork restraints on the bottles to avoid a sticky mess. 8. Enjoy this winter aperatif as you would port, either at cellar temperature or over ice. This entry was posted in Beverages and tagged Apero, Walnuts, Wine. Bookmark the permalink.